FAQ - PRICING - What is Google Business View? A Google Business Photo shoot consists of two parts: A virtual tour walkthrough using Google Street View technology and still photos of your business. Your Virtual Tour and Photos will appear in Google Search, on Google Maps and on your Google+ Places (Local Business) Page. This is just like Google Street View – but for the inside of your Business. It gives internet users a 360-degree virtual walkthrough allowing you to showcase all the details of your business. Sort of "try before you buy" that customers love. The service is perfect for restaurants, retail shops, automobile dealerships, doctors, dentists, lawyers, gyms, salons, and more. You can embed the Virtual Tour on your website just as you would a Google Map. However, you may want to take advantage of a more advanced website tour which can add sound, text, interactive elements and much more to create an even more immersive, persuasive experience. A website tour can also feature people whereas a Google tour shouldn't. Any faces must be blurred and in still photos even partial faces aren't allowed nor is blurring of faces. So, no people at all or only the backs of heads. What is SEO and How Does Google Business View Affect It? SEO stands for Search Engine Optimization -- optimizing a website to improve its ranking on search engines. The higher your site appears in search results the more likely people are to click through to the site itself. Our website tours have a significant impact on search ranking. Google tours don't. But Google virtual tours can significantly increase the click-through rates from the search results to a website. However, Google also has Local Search Results which draw from its Google+ Local (Business) listings. These appear above regular search results. Search for "Chinese restaurants in Naples" and you get a selection of results in the thumbnail bar at the top of the page. Search for "Dentists in Naples" and you get a list below the paid results on the left and a map on the right. Here Google Virtual Tours can influence ranking. The cost is one time, nothing additional. The business owner gets full access to and use of the photos and virtual tour. The tour can be embedded on your website, Facebook or blog. If for some reason you would like any of the photos or virtual tour removed from your business listing, it can be done by you. If you would like an updated shoot to reflect seasonal changes, new features, a remodeling or whatever it can be arranged as an additional shoot at a discount. Google vs Website Tour -- Which is Better? Google and Website virtual tours both have advantages. For many businesses using both is actually best. We will help you determine which one is better for you, or both, and how to allocate budget to best meet your needs. ONLY Google Virtual Tours and Photos appear right in Google search results, on Google Maps and as part of Google+ Local pages. This produces better results throughout Google. Price: Google's automation and volume keep costs remarkably low. Improved Google Local Results Ranking. A mobile version that plays on any iOS, Android or Windows mobile device, although without full up & down viewing and some image distortion. No website? No problem. 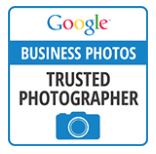 Google Business View and Virtual Tours are hosted by Google and get results even if your business has no website. Your Google+ Local Page to some degree fills in for a regular website. The best option if your website doesn't allow virtual tours. This is especially true of franchise sites, many canned or template sites or if you just don't want the programing challenge. PEOPLE! Website tours can feature people and their unblurred faces. Native SEO improvements on all search engines. Real 360x180 viewing on mobile devices. Look all the way up and down without distortion. Works on all iOS devices and most Android and Windows devices but not all, especially if older. If enough of your message is conveyed with the Google tour remember that you can embed it in your web page. That improves your website effectiveness but has minimal if any effect on search engine results anywhere. Effectively, only content hosted on your website improves your site's organic SEO ranking in all search engines. Of course, Google tours and photos still produce better results throughout Google, including in local searches.